The Croono makeup brush by Central Saint Martins graduate Taeheon Kim is an attempt to break down gender barriers by redefining masculinity through objects. The metallic silver, gold and bronze coloured brush set comes with a single handle and four magnetic brush heads in different sizes. "I created a modular makeup brush for men to challenge how everyday objects define and demarcate masculinity," explained Kim. "I am interested in how designers can positively impact social structures." The London-based product design graduate noticed that the demand for men's grooming, skin care and makeup has been increasing in recent years. However, he found that the products in the makeup category are not yet enabling men to feel comfortable participating. Kim's modular makeup brush is designed to reflect the softer side of masculinity. During his research for his graduate project, Kim noticed that "old-fashioned" definitions of being a man were still being reinforced by the design language utilised to make gendered products. Products that were stereotypically male, for example tool kits and pen knifes, were stored in boxes that had pre-assigned and labelled positions for individual parts and each part has versatile uses. On the other hand, products that were stereotypically female had singular uses, high levels of specificity and items were mixed together freely, as seen in make up bags and sewing kits. "For a male consumer then, walking into a makeup store is difficult. He doesn't know what to buy, is used to simple modal solutions, yet has to forage for various multiple brushes or applications for specific uses," explained Kim. "Often, he will leave the store because he doesn't know what to do. It's this interaction with products that I wanted to address in Croono." Croono comes in an oak box with one handle and four brush-heads; two large with hexagonal shape, and two smaller squared brushes. The user can tell them apart by shape, size and colour without needing a labelling system. The different brushes fit into either end of the handle and when not in use, each has its own inbuilt lid to protect the bristles. Magnets make mounting the brush heads easy. "When it comes to gender identity, it's easy to fall into a pattern of design language that over emphasises the importance of colour, shape, or texture. Yes, that can be interesting. However, gender identity is not just about how things look," explained Kim to Dezeen. The geometric-looking Croono is strong, lightweight and made of anodised aluminium. Avoiding colours that have cliches with gender, Kim chose silver and gold finishes to give the set a modern feel and a "fun ambiguity". The prototype was 3D printed. "I want to make gender identity a mechanism for people to feel included, rather then excluded. In order to do that as designers we have to broaden boundaries and create variation, not deny specific identities or attempt to erase the concept of gender identity entirely." 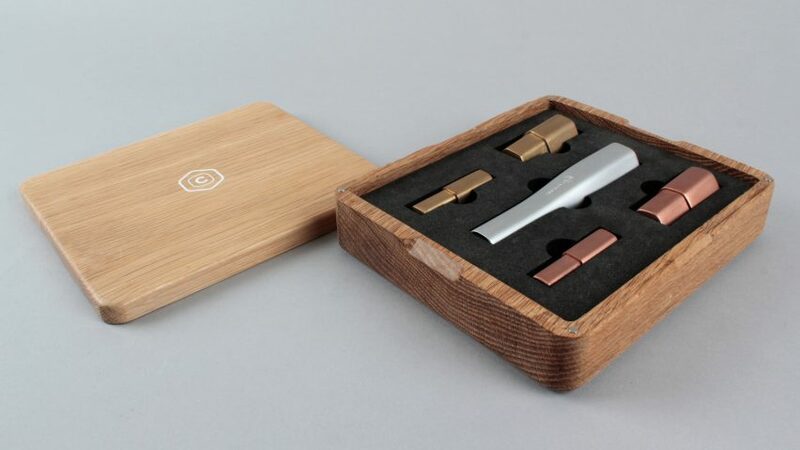 Another graduate to design cosmetics aimed at men is Annemiek van der Beek, from Design Academy Eindhoven, who created a collection of make that's packaged to appeal to male users. Earlier this year Seymourpowell created a concept that uses AI to decide your skincare routine.